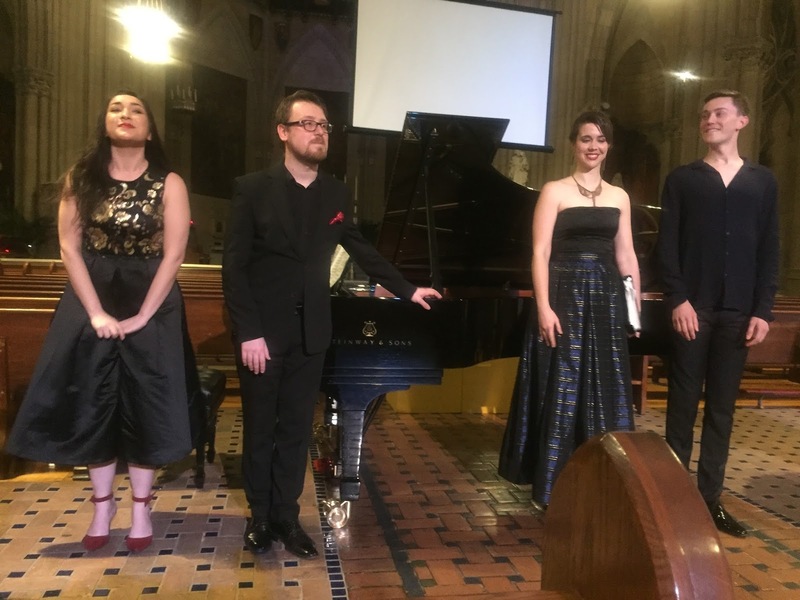 Before we tell you about one of the best art song recitals we have ever seen, we have some exciting news about the venue, shared by Alessandro Pittorino, Executive Director of Arts at Blessed Sacrament Church. The church has acquired a magnificent Steinway piano in the sanctuary so that recitals can be held there instead of in the cozy cellar. We had no beefs about the cellar but the acoustics in the sanctuary are undeniably better. And the piano has a particularly fine sound, especially as played by our two collaborative pianists Katelan Terrell and Michal Biel. We have heard Robert Schumann's song cycles more times than we can count but we cannot recall hearing them performed better. The program began with mezzo-soprano Marie Engle, who sounds like eine engel, performing Frauenliebe und -Leben in partnership with Ms. Terrell. Perhaps it is our imagination, but having two women performing the cycle added a new dimension and kinda sorta made up for the fact that the text, written in 1830 by Adelbert von Chamisso and then set within the decade by Robert Schumann, involved men! We do not know whether this was the poet's interpretation of a woman's life and loves or whether this was culturally accurate but the content would have us believe that a woman's life begins when she meets her future husband and ends when he dies! Nothing happens in between childbirth and widowhood! In order to enjoy the many pleasures of the cycle, one has to set aside our contemporary view of female equality and self-fulfillment. The middle of the 20th c. seems just as remote as the 19th c. Just ask your mothers and grandmothers! The pleasures of the cycle are the perfect union of text and music and the marriage of vocal line to piano accompaniment. Last night, the extra pleasure was experiencing the many moods of the subject which our performing artists conveyed with consummate communicative skill. "Seit ich ihn gesehen" is filled with wonder, bordering on awe. "Er, der Herrlichste von allen" is replete with excitement as the girl idealizes her beloved. In "Ich kann's nicht fassen, nicht glauben", she is overwhelmed by being the chosen one. In "Du Ring an meinem Finger" she expresses her exalted intent (like Sophie in Der Rosenkavalier) to devote herself fully to her husband; the ring symbolizes the husband-to-be. In "Helft mir, ihr Schwestern", the piano provides a wedding march for the girl's special day. In "Süßer Freund" she becomes more solemn as she hints to her husband that she is pregnant. We were enjoying Ms. Engle's word coloring all along but there was something special she did with "lust". The tempo increased as did the woman's heartbeat. Yes, she has gone from girl to woman. Her excitement over nursing her infant in "An meinem Herzen" seemed ecstatic--almost delirious. And then....hubby dies. The terrible chord in the piano announces the shock and the woman experiences that frightening mixture of grief and anger that is so common in loss. Ms. Engle's coloring of the word "leer" (empty) gave us cold chills with its subtle alteration of vibrato. The piano postlude recalls the first time the woman laid eyes upon the man. We were left shaken, no longer scoffing at the archaic nature of the text. This was completely due to the intense involvement of Ms. Engle and Ms. Terrell. We might add that Ms. Engle's German was perfect and so clearly enunciated that we didn't miss a word. Titles were superfluous. The second half of the program comprised a performance of Schumann's Dichterliebe, the likes of which we have never heard. Swiss baritone Äneas Humm came to our attention through the German Forum when he was but 20 years old and already famous in Europe. We loved his voice and communicative skills 3 years ago but we have noted an impressive development in the texture of his voice after just one year at Juilliard, where he studies with Edith Wien. His voice filled the sanctuary with overtones. We have reviewed Dichterliebe half a dozen times within the year and three times within the past month! We have not tired of it because each singer has offered a different interpretation. This is one of the distinguishing features of a great work of art. Mr. Humm's very personal interpretation was fully in the present. This was not a reflective summation of a love affair gone wrong. Mr. Humm seemed to be experiencing the events in the moment. Mr. Biel's piano supported that interpretation. In "Im wonderschönen Monat Mai", the poet suffers from limerence but Michal Biel's piano hinted at a less sanguine reality. The vocal line trailed off unresolved and we began to hear some anxiety in "Aus meinen Tränen sprießen". The subject idealizes his beloved with intense excitement in "Die Rose, die Lilie, die Taube, die Sonne". We loved the change of color with which Mr. Humm invested the voice of the beloved as she professes her love in the phrase "Ich liebe dich". This is how the subject wants to hear it! Things got dark in "Im Rhein, im heiligen Strome" when the subject became serious, spooked out by seeing the beloved's face in an inappropriate place (a portrait of the Virgin in the cathedral). The dark colors of Mr. Humm's lower register struck deep. "Ich grolle nicht" is the song of the cycle in which we have heard the most variety. The subject seems to be keeping a stiff upper lip but the piano lets us hear the depth of his suffering. Mr. Humm artistically portrayed the melange of anger, bitterness, and pain. "Das ist ein Flöten und Geigen" involved unadulterated bitterness with Mr. Biel's piano adding much emotional tone. His piano gave us brief respite in the gentle "Hör ich das Liedchen klingen" before the renewed bitterness and irony of "Ein Jüngling liebt ein Mädchen" which was introduced by a jaunty piano tune. Another highlight of the cycle was "Ich hab' im Traum geweinet" which began with a capella voice and was then punctuated by portentous chords. We also loved the twist at the end of "Allnächtlich im Traume". Mr. Biel's descending arpeggi in "Die alten, bösen Lieder" served to highlight the subject's attempt to find closure by sinking a coffin filled with his old love songs into the waters of the Rhein. Was this just adolescent hyperbole? We have read that the poet Heinrich Heine was satirizing Romanticism but we are not sure. That is what is so special about Schumann's setting and the singer's interpretive skills. That is the reason why we can hear this cycle several times in a month and not get bored! Mr. Humm and Mr. Biel took us on an exhaustive emotional journey through joy and excitement to anger, bitterness, and despair, with a final acceptance. Fortunately we were not to be left in gloom. Oh, no. There was a perfectly upbeat duet in which Schumann set a charming folksong "Wenn ich ein vöglein wär" performed by the two singers and piano four-hands. Somehow we were reminded of Brahms, which is always a good association. "Songs from the Cellar" has gotten off to an impressive start, with all the artists coming from Juilliard. Ms. Terrell and Mr. Biel are the Co-coordinators of this art song series. The two have come a long way in one short season by providing top quality entertainment and artistry for the Upper West Side Community. We have watched with great pleasure the growth of the audience. We don't know yet whether they will change the name of the series to "Songs from the Sanctuary". It doesn't matter what they call it; it is worth your while. We can barely wait for the Autumn season and promise to keep you informed.